صادقی, زین العابدین, هاشمی, فریبا السادات‌, اکبری فرد, حسین. (1395). بررسی روند کارایی انرژی در بخش حمل و نقل. 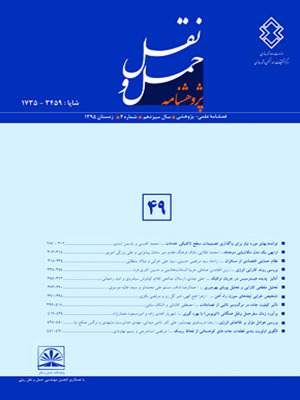 پژوهشنامه حمل و نقل, 13(4), 54-75. زین العابدین صادقی; فریبا السادات‌ هاشمی; حسین اکبری فرد. "بررسی روند کارایی انرژی در بخش حمل و نقل". پژوهشنامه حمل و نقل, 13, 4, 1395, 54-75. صادقی, زین العابدین, هاشمی, فریبا السادات‌, اکبری فرد, حسین. (1395). 'بررسی روند کارایی انرژی در بخش حمل و نقل', پژوهشنامه حمل و نقل, 13(4), pp. 54-75. صادقی, زین العابدین, هاشمی, فریبا السادات‌, اکبری فرد, حسین. بررسی روند کارایی انرژی در بخش حمل و نقل. پژوهشنامه حمل و نقل, 1395; 13(4): 54-75. در این مطالعه تلاش شده است تا روند کارایی انرژی دربخش حمل و نقل با استفاده از رویکرد تحلیل تجزیه شاخصIDAو روشLMDI درسالهای 1383 تا1390بررسی شود. دراین روش ابتدا تغییر مصرف انرژی به اثرات آن تجزیه می‌شودوبا استفاده از اثر شدت، صرفه جویی‌های ناشی از بهبود کارایی مشخص شده، سپس با استفاده از شاخص عملکرد انرژی روندکارایی بررسی می‌شود. بخش حمل ونقل به دلیل استفاده از شاخص‌های اندازه­گیری فیزیکی به دو زیر بخش حمل ونقل کالا وحمل ونقل مسافر تقسیم شده است. در مورد حمل و نقل مسافر نتایج، عدم کارایی در این بخش را نشان می‌دهد و تنها در سال 1386 بهبود کارایی باعث صرفه جویی مثبت دراین بخش شده است. دربخش حمل ونقل کالا برخلاف حمل و نقل مسافر،کارایی در اکثر سالها به جز دو سال 1384 و1387 افزایش یافته و صرفه جویی‌های مثبت ناشی از افزایش کارایی وجود داشته است. In this study has been attempted to investigate energy efficiency in transportation sector by using an index decomposition analysis approach IDA and LMDI method. In this method, at first analysis the Changes of energy consumption to it's effects and then by using intensity effect savings from improving efficiency is specified, then checked efficiency trend using energy performance index. Transportation sector due to use of the physical measurement indexes are divided to two subsectors: goods transport sector and passenger transport sector. Results in passenger transport sector, shows lack of efficiency in this sector. Only in 2007, improving efficiency causes to positive savings in this sector. In goods transport sector, despite of passenger transport in most years except for 2005 and 2008, efficiency has been increased and savings from increased efficiency has been positive. - Amin, S. H., & Zhang, G., (2013), "A multi-objective facility location model for closed-loop supply chain network under uncertain demand and return". Applied Mathematical Modeling, 37(6), pp. 4165-4176. - Bouzembrak, Y., Allaoui, H., Goncalves, G., & Bouchriha, H., (2011, May), "A multi-objective green supply chain network design". In Logistics (LOGISTIQUA), 2011 4th International Conference on pp. 357-361. IEEE. - Collette, Y., & Siarry, P., (2003), "Multiobjective optimization: principles and case studies". Springer Science & Business Media. - Dotoli, M., Fanti, M. P., Meloni, C., & Zhou, M., (2006), "Design and optimization of integrated e-supply chain for agile and environmentally conscious manufacturing". Systems, Man and Cybernetics, Part A: Systems and Humans, IEEE Transactions on, 36(1), pp. 62-75. - Fleischmann, M., Beullens, P., Bloemhof‐Ruwaard, J. M., & Wassenhove, L. N., (2001), "The impact of product recovery on logistics network design". Production and operations management, 10(2), pp. 156-173. - Guide Jr, V. D. R., & Van Wassenhove, L. N., (2009), "OR FORUM-the evolution of closed-loop supply chain research". Operations Research, 57(1), pp. 10-18. - Le, T. P. N., & Lee, T. R., (2013), "Model selection with considering the CO2 emission alone the global supply chain". Journal of Intelligent Manufacturing, 24(4), pp. 653-672. - Luo, Y., Zhou, M., & Caudill, R. J., (2001), "An integrated e-supply chain model for agile and environmentally conscious manufacturing". Mechatronics, IEEE/ASME Transactions on, 6(4), pp. 377-386. - Melo, M. T., Nickel, S., & Saldanha-da-Gama, F., (2009), "Facility location and supply chain management–A review". European Journal of Operational Research, 196(2), pp. 401-412. - Wadhwa, V., & Ravindran, A. R. (2007). Vendor selection in outsourcing. Computers & operations research, 34(12), pp.3725-3737. - Wilkerson, T., (2005), "Can one green deliver another” Harvard Business School Publishing Corporation. Retrieved January, 10, 2012.